I made the mistake of buying an iSense, and have sent it back. 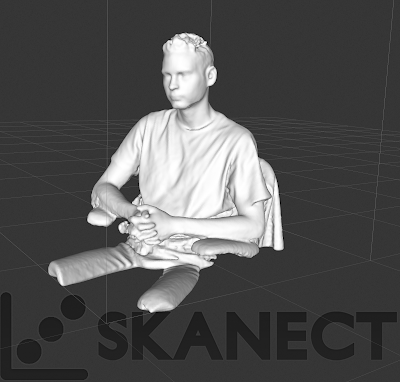 What you need, if you want to do some 3D scanning, is the Structure scanner and Skanect s/w. I purchased the scanner from Technology Outfit, who seem very efficient. Well, the iSense s/w is all in the iPad, which is not bad processing wise, but not good enough when used with the iSense app. It was incredibly slow to scan something. It also did a very poor job. I was really difficult to work out the initial scanning area. I just about managed to scan a face, but scanning a person was a waste of time. It then took an age to process. The Structure/Skanect solution uses the iPad as a remote for the main s/w on the computer (in my case a Mac) over wifi. It is quick, and really easy to use. The result is much better. Both are basically the same as a kinect, and fit to the iPad with a bracket. In fact they look identical and even have the same connectors. I used Skanect once before, with a hand held Kinect, but that was really difficult to man handle the laptop and scan. The iPad as a remote scanner works well, and it appears to use the iPad accelerometers as well which makes it even easier than using the Kinect. P.S. Oh, and there are a load of free iPad apps to work with the scanner stand alone, cool!